…Once married, I survived six weeks on the road with Tribhanga selling Spiritual Sky incense and eating only his homemade version of trail mix. His recipe called for a couple of tins of mixed nuts and salted peanuts, a package of dates, and a bag of shredded, sweetened coconut, all mixed together in a paperbag. During our travels, Tribhanga got a huge order for incense in Louisville, Kentucky, so we returned to New Vrindaban to fill the order. There we saw Dharmatma dasa, a sankirtan leader from Vancouver, who was looking for a place to repair an old Road Show bus he’d just bought. Tribhanga invited Dharmatma prabhu and his group to come with us to Louisville, because there he knew a favorable couple, whose house we’d stayed in. Dharmatma drove his bus to Louisville and parked on the street in the couple’s neighborhood. We filled our order and left town, but he and the other devotees with him stayed three weeks longer. One brahmacari befriended a neighborhood girl, who showed up at the bus with packed bags just as the bus was leaving for a festival at New Vrindaban. Dharmatma refused to bring her along because she was underage and her father was the leader of a motorcycle gang. When the devotees left, she ran away from home. Her father thought she was also going to New Vrindaban, and he drove there to look for her during the weekend festival. The festival attracted more than two hundred devotees, and Vishnujana Swami led the most beautiful kirtans during the festivities. Not only was an Ananta Sesa Deity buried under the cornerstone of a future temple, but also two sets of small, brass Radha-Krishna Deities were installed, one set for the Vrindaban farm and the other for Madhuban. It was an open-house festival, and the girl’s father showed up in his old convertible—one of those really huge ones. He came with another man and the local sheriff. Devotees escorted them around, to convince them his daughter wasn’t here. The father returned a second time, with his friend and two ladies, to see more and ask more questions. However, the matter wasn’t settled that weekend. After my six weeks on the road with him, Tribhanga traveled and sold incense alone, returning occasionally, while I lived at the Bahulaban farm, following a tight schedule. I went on the altar mornings and evenings, helped to roll hundreds of chapatis for lunch and baked the four p.m. offering. I came to Bahulaban too late to get Mother Silavati’s training—she had moved to New York—but Kutila dasi, Kuladri’s wife, was an excellent head pujari and a stickler for kitchen cleanliness. I loved the pujari service. Following a rotating schedule in the mornings, I dressed Radharani once a week, Vrindaban-candra once a week and either tiny Radha-Krishna or Lord Jagannatha the other days. However, every evening for nine months, I dressed the same Deity: Srimati Radharani. I took off Her day clothes and jewelry and put on Her nightclothes. I became quick and adept, because we had little time. One night, in the usual rush to finish on time, I looked at Radharani’s face and froze, thinking, “This is Radharani!” But I had to set aside that thought to continue my service. I knew a passage from The Nectar of Devotion about Daruka feeling ecstasy while fanning Krishna, but setting aside his feeling to continue his service. I wasn’t on Daruka’s platform of devotional love, but I felt something similar that day by recognizing Radharani and then continuing to serve Her under time pressure. “If you think it is a brass-made doll, I mean to say, idol—ye yatha mam prapadyante tams tathaiva bhajamy aham—if you think this is a brass-made idol, then it will remain a brass-made idol to you forever. But if you elevate yourself to a higher platform of Krishna consciousness, then Krishna, this Krishna, will talk with you. This Krishna will talk with you. In June, 1973, during the week following the open-house festival, an armed motorcycle gang attacked the temple. It was a local gang hired by the distraught Louisville father, who was with them, still looking for his runaway daughter. Surrounding the temple in the early morning, as the Srimad-Bhagavatam class was being held, they fired shotguns through open windows and doors, hitting two men, to gain control. I was on the altar bathing the Deities. Kutila prabhu and I managed to place the small Deities—Jagannatha and Radha-Krishna—out of sight behind the altar before we were ordered into the temple room. There I saw Bidhan Candra and Krishna Katha prabhus lying bleeding on the floor. We chanted the Nrsimha-deva prayers for the Lord’s protection, but a gang member demanded, “Stop your chanting!” and shot another bullet through the ceiling. “If you don’t give us the girl, we’re going to kill all of you!” one of the villains threatened. Terrified, I truly thought we were all going to die because the girl wasn’t there and had never visited New Vrindaban. The previous weekend, when her father had looked for her at our festival, he’d seen a cornerstone-laying ceremony, at which a Deity of Ananta Sesa was buried in a deep pit. He thought we had sacrificed the girl, and was convinced the pit was the girl’s grave. “I was,” Dharmatma prabhu admitted. We helplessly watched Kirtanananda and Dharmatma being taken away. Miraculously, the girl’s father did not recognize the brahmachari who’d befriended his daughter, though he was right there, in the corner of the temple room, fearing for his life. We softly chanted japa, praying fervently to Lord Krishna. The loud sounds of the two Deities hitting the marble floor frightened the gang members walking up the hill. While the first crash was startling, the second sounded like a gunshot, and they thought the devotees had gained control of the situation. They began to run away, yelling at those inside to join them. Thus the ordeal suddenly and unexpectedly ended. The wounded men were taken to the hospital and Radha–Vrindaban Chandra were carried to Kirtanananda’s house. Kutila and I retrieved the small Deities. She hid Radha-Krishna somewhere safe, while I and others carried the Jagannatha Deities to Talavan, a more secluded farm. We prepared for the gang’s return because one thug had threatened, “We’ll be back tonight to burn the place down.” The police refused to protect us, so by nightfall the devotees had armed themselves. Several devotees stayed up all night to guard the farm, hidden from sight with all the lights out. But by Krishna’s mercy neither the father nor the gang ever returned. “I am in due receipt of your letter dated June 6, 1973 and have noted the contents with great care and concern. The Deities may be immediately repaired and worshipped. Now we must take precaution as you have suggested. You may get some guns and some of the boys may be trained as ksatriyas [warriors]. Such gun shots could have taken place long ago since we are challenging everybody. So we must be prepared to fight. We cannot stop this movement. It is actually a fight against Maya. So Maya may also sometimes cause casualties in our camp. So, we must only thank Krishna and seriously dedicate everything for Him. So, you are Kirtanananda Maharaja, take pleasure in performing kirtana. That is our real weapon against Maya”. “After the shooting affair what precaution have you taken? Bharadraja is here and he gave report that the devotees were very frightened. I further understand that the attack was for the second time. Here in Mayapur there are reports of dacoits at least once or twice in a month surrounding our place. So we have now taken two guns under regular license from the government. So when New Vrindaban has been attacked twice, thrice, why are you not keeping guns? We are not advocates of non-violence; when there is aggression we must kill them. So I think you shall immediately arrange for guns and at least 10, 12 men should be trained up so when there is again attack you can properly reply the aggressor. To add insult to injury, these gang members were tried in the local court but not convicted, despite the testimony of many devotees. Justice, it seems, would be attained only on a higher plane, not in the material world. I left New Vrindaban on January 3, 1974, three years to the day since I had joined ISKCON. 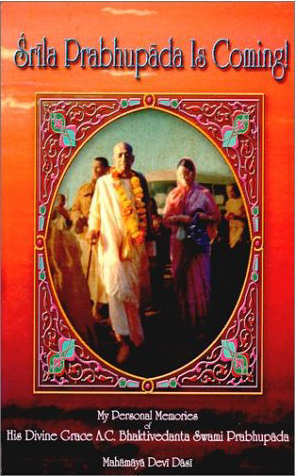 I purchased my copy of Shrila Prabhupada Is Coming some years ago from the author herself at a San Francisco Rathayatra. But it was a recent reading of Suhotra Maharaja’s In2Me-C Diaries that reminded me what a great book this is. Suhotraji loved Mahamaya Mataji’s spirited romp through the seventies for the same reasons I do. Her writing overflows with all sorts of rare Prabhupada-centered lessons. Her recounting of events is an honest history of the movement with scrupulous attention to detail. She squarely faces the devotees’ struggles in service and in preaching, and—as the title implies—the book radiates with our ever-present excitement of the pure devotee’s soothing appearance in our lives. Therefore, this is not a “ladies only” book; it is written for all devotees who yearn for the blessings of Krishna’s representative, those who share in the same goal we all crave that Shrila Prabhupada called Krishna consciousness.